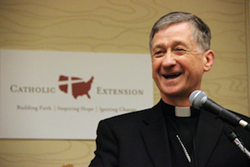 Cardinal-elect Cupich serves as Chancellor of Catholic Extension. "Catholic Extension has worked closely with Archbishop Cupich for the past 18 years. Throughout this time — and especially since he became our Chancellor two years ago — we have come to know him as an extraordinarily gifted Church leader. "Archbishop Cupich’s vision and passion align closely with Pope Francis’ call for the Church to 'go out to the peripheries.' This missionary orientation has also been the mission of Catholic Extension, which for more than 110 years has been building churches and the Church in America’s 'periphery' — its poor, rural and remote 'home mission' dioceses. "All of us at Catholic Extension extend our heartfelt congratulations and prayers to the archbishop on his appointment." For more information on Catholic Extension, visit http://www.catholicextension.org. Media inquiries should be directed to Lisa Gunggoll, 708.829.8669 or lisa(at)lg-pr(dot)com. About Catholic Extension: Catholic Extension serves 90 mission dioceses throughout the United States. Since its founding, it has extended almost 12,500 grants for the construction and repair of churches and church facilities and has awarded a total of $1.2 billion (in today’s dollars) in grants to dioceses that cannot support themselves.For more information visit http://www.catholicextension.org or follow us on Facebook at facebook.com/catholicextension or on twitter at @CathExtension.